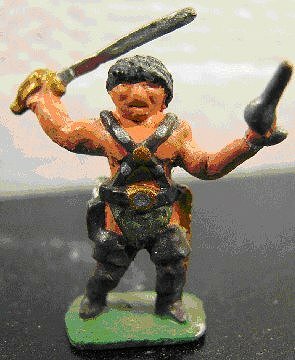 Fantasy war games was becoming ever more popular in the 1970s and 80s, and more than one company was pursuing the idea of using the Mars series of Edgar Rice Burroughs as an outlet. It was after all an ideal playground with warring nations on an alien world made up of a multitude of species. 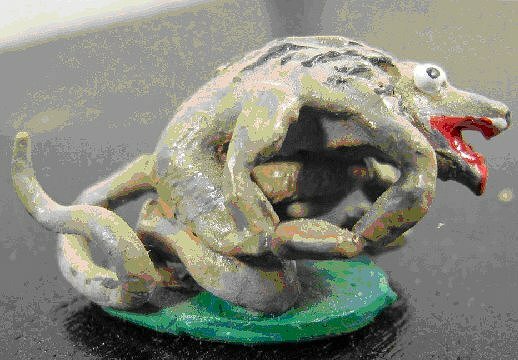 The skill of the modeller is put to the test in not only recreating a three dimensional image as described by Burroughs, but doing it in the miniature world needed for gamers to play with. 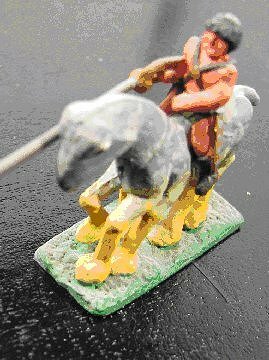 The human figures created by Heritage and Hinchliffe are just 25mm (1") in height cast in moulds and formed of a white soft metal. The green Martians by Heritage are 60mm and closer to the human / green Martian ratio that Burroughs intended. Hinchliffe were less exact with keeping to the proportions intended, caring more in some cases for the detail of the figure rather than size. 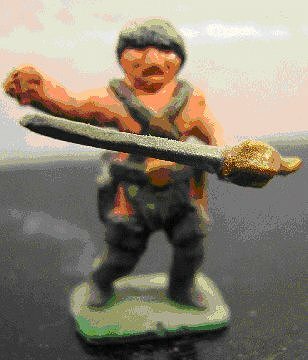 Following ERB-APA's #100 publication, fellow APAn Fredrik Ekman mentioned my article on Heritage figures to friends on the Yahoo Barsoom gaming group, some of them even bought copies of our centenary issue, but one person, Dave Woods, made contact with me to discuss the figures further. 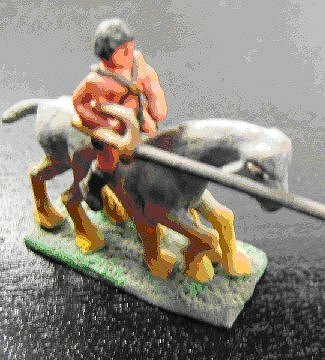 Dave kindly verified my assumption in my last submission that the figures were indeed from Hinchliffe but they were never sold in blister packs like those from Heritage Models Inc. According to Dave Woods, the following group of figures are part of the Stan Johansen range. 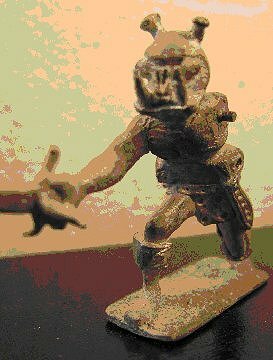 If one was to look at just the warrior figures alone (which are amongst the poorest of design), one could assume they could belong to something non-Burroughs if it had not been for the fact that the same style figure is sat astride an unmistakable Martian thoat. 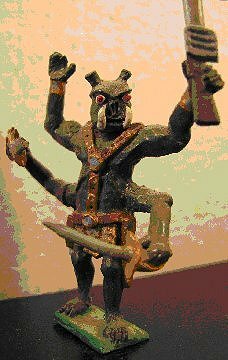 What follows is a range of figures whose origin remains a mystery. I am assuming the first to be an ulsio – the multi-legged rat (which makes its last appearance in Llana of Gathol where we learn that it has six legs – a reference the modeller has taken note of). The last is a Green warrior – it has just not been completely assembled. On numerous occasions, much has been said about leaving comments on others work in the previous issue and I, like the majority of you, look forward to see if anyone has made a comment about your work. It is after all, gratifying to know that someone has not only looked at those long hours you have put in, but also read it and digested it to the point that they wish to make some kind of comment. There have been times that I have made the occasional comment but those are few and far between. I would just like to make the point that as someone who lives outside the United States, not only is my paper supply limited as our paper size differs from your own and can only be replenished whenever I visit your shores – which of course adds weight to my luggage – but also the cost of sending my contribution back across the Atlantic which can make this an expensive hobby particularly if one has an extra page times 50 of commentary. Perhaps the day will come when this recession is a thing of the past and I can move to Michigan, gain useful employment to see me through to retirement and Judy and I can finally wed – and only then, if I am still a member of this wonderful group, will I consider to regularly add a comment to your contributions. 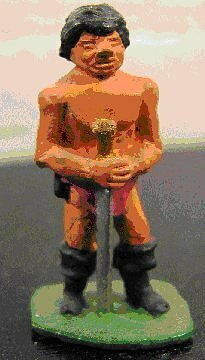 My one comment I would like to make while I have space is to Tracy Griffin – and in answer to your question of whether I shall be purchasing the newer Martian figures that are appearing on the internet, it is, "No." I have other commitments these days and I would like to say that the majority of my collecting days are over – but then again we haven’t seen what will be marketed when the new John Carter movie comes out. Maybe it is just as well that Disney are not producing it. I have enough green boxes of Tarzan to last a lifetime – I don't want to see a sea of red boxes too. 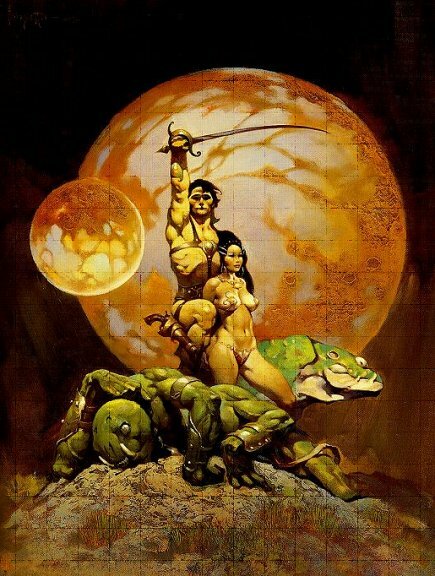 The first time I ever saw Frank Frazetta's A Princess of Mars, I knew that this was why I enjoyed Edgar Rice Burroughs novels so much. John Carter holding his sword arm aloft in a fist of triumph, his trim muscular figure the epitome of human development, strength and fitness. Dejah Thoris at his side, absolutely stunning, naked and firm, what more could a man desire? With the faithful Woola at their side, John Carter's arrival on Barsoom is complete with Thuria and Cluros captured together as they stand on the hillside. The one curiousity of this painting is the green warrior at their feet. He appears to be attempting to rise, but John Carter's foot is holding him down. 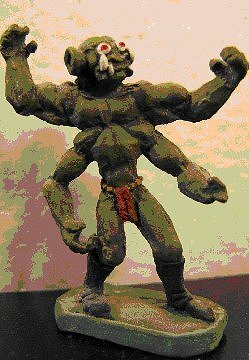 John Carter may be the finest swordsman of two planets, but I doubt his strength is geater than that of a 16-foot green Martian. 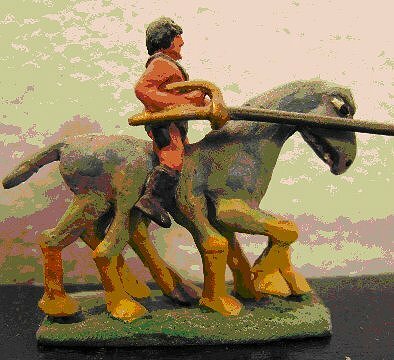 And of what race is he, Thark, Warhoon or Torquasian? At what point is this image taken, after all by the end of the opening trilogy, John Carter had united a world of races including the Tharks that had previously been at war and distrust of one another. One could therefore assume the green warrior is either Warhoon or Torquasian as no unity with those tribes is ever achieved during the eleven novels. But that hardly describes the painting of one of unity with the subjugation of a species. Despite this, I love the painting and it is what grabs me most of the Martian novels. 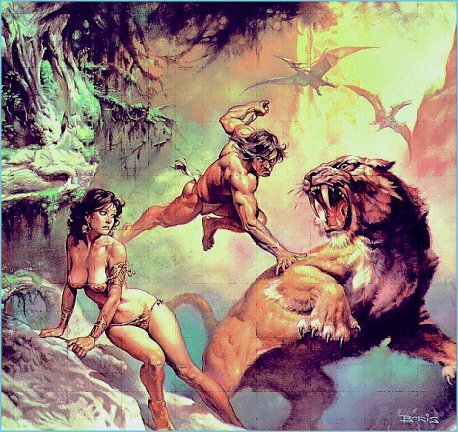 My second favourite painting is by Boris Vallejo that appeared on the cover of the Tarzan calendar in 1978. This depicts the savage world of Tarzan where only the mightiest can survive. His upbringing was fraught with danger at every turn in his childhood and youth that it is a wonder that any creature lives to adulthood. Here we see a beautiful girl, near naked, her breasts barely contained in a bikini top, her thong slowly slipping down at one side, and is helpless as she is about to be devoured by the savage sabre toothed cat. The cat is fearsome, lithe and dangerous. Every pore on its body depicts strength that surely no living thing could possibly stand in its way, and certainly not the female figure that it has cornered and will fill its stomach for the next few days. But the sabre tooth had not reckoned on Tarzan. He that has grown up in a world where agility, strength and cunning has brought him through the dangers of the jungle and his heritage has also taught him to defend the weak. He leaps towards the back of the cat, his knife in his hand, swung back ready to strike the cat with a powerful blow. The cat is startled by this newcomer who has interrupted his intended kill and finds that he the hunter, is about to become the hunted. The painting itself is unusual because it is in motion. The vast majority of Boris's work is statuesque and while near photogenically perfect, hardly surprising given that he uses models all the time, there is little in many of them that one can describe as exciting, beautiful perhaps, captures our attention maybe, but very little excitement which is why this particular painting grabs me so much.